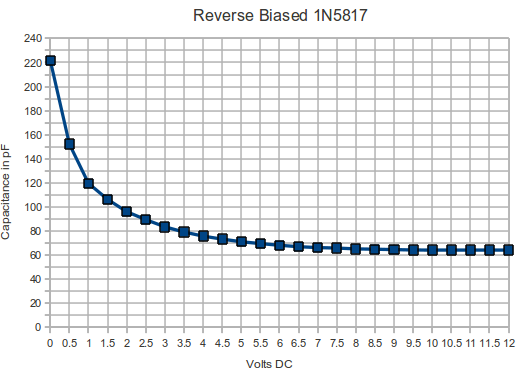 Tonight I was playing with the idea of using reversed biased LEDs and Diodes as varactor diodes or variable capacitors. Hans Summers has done a lot of testing around this concept for use in CW and QRSS transmitters. I mocked up a simple test on a bread board and used my AADE LC meter to take some basic measurements. This is largely based upon a picture that I saw on Han's site. I used a variable bench power supply to run the tests. I might build a simple printed circuit board fixture for future tests so that I have solid tool with reproducible results. Overall it was a fun experiment that shows some practical promise for some future projects.